For several months now there have been rumors about some new Microsoft Lumia smartphones that would be more highly specced than the last few releases. The Microsoft Lumia 840 and Lumia 840 XL are two of these, and evidence has been growing following spots of the phones in testing. While we wait for them to be made official, we want to share a Microsoft Lumia 840 render that comes with detailed specs. The Microsoft Lumia 840, Lumia 840 XL, Lumia 940 and Lumia 940 XL have all been the subjects of increasing leaks, with the first two models for the mid-range of the market and the latter two distinctly high-end. In May we reported that units of the Lumia 840 and 840 XL were being tested in India. These phones look likely to release running the Windows Phone 8.1 GDR2 update rather than Windows 10 for Mobile, although they will be upgraded to Windows 10 at some point. We’ve already seen several concept designs for these smartphones (example one, example two), and they can offer some ideas for what could finally arrive. These latest renders of the Microsoft Lumia 840 show what looks to be a realistic design for the phone, as the handset sticks to the familiar Fabula design. It comes from designer Karl Jayson Panase and some of the provided specs tie in with those that have been rumored. The imagined specs that go with this Microsoft Lumia 840 design include a 1.7GHz Snapdragon 610 quad-core processor, Adreno 405 graphics, and a 5-inch AMOLED ClearBlack display with Full HD resolution of 1920 x 1080. There’s 2GB of RAM and a 2600 mAh battery. Camera capabilities include a 13-megapixel rear PureView camera with Zeiss optics, 1/2.3-inch sensor, f/1.9 aperture, dual LED flash, and the bonus of OIS 2.0. 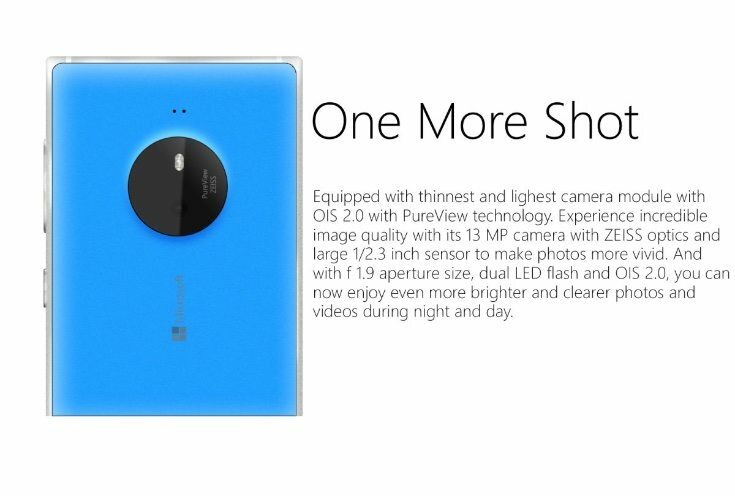 There’s also a 5-megapixel front-facing snapper with wide-angle lens. Just as we expect for the real deal, this Lumia 840 is running Windows Phone 8.1 update 2 that will receive an upgrade to Windows 10 Mobile. 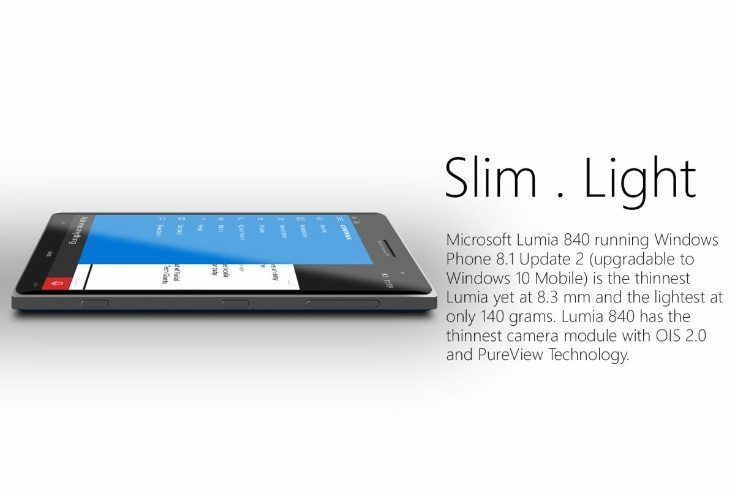 It has been designed as the slimmest Lumia handset so far and is 8.3mm thick weighing in at just 140g. There are capacitive buttons as well as a dedicated camera button, and it comes in black, silver/grey, blue or white color options. Many concept ideas that we see are rather futuristic, so it’s good to see this vision of the Microsoft Lumia 840 as rather more believable. We’ve shown a few of the images here and you can see more at the source below. 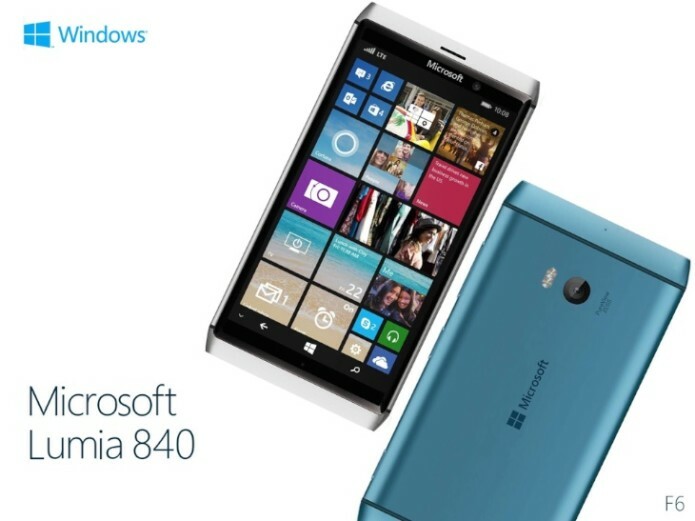 Give us your thoughts on this Microsoft Lumia 840 design? Would you be happy to see something similar to this at the official unveiling? Samsung Galaxy S10+ camera test vs iPhone XS, Pixel 3, and Nokia 9 : We put the camera on the Galaxy S10+ to the test. Are Pop Up Cameras The Answer To Our Full-screen Ambitions?